Farside bar plays VHS, vinyls and trivia to help quell any nostalgia you’ve had for the last great decade. The host with the most, Russel Harder, is nicknamed the man in the bow tie. Deep in the heart of East Chinatown flashes a neon “Open” sign with a palm tree. It’s Wednesday trivia night, which Russel Harder, aka the man in the bow tie, holds every other week at Farside bar (really, he wears a bow tie to every trivia night). 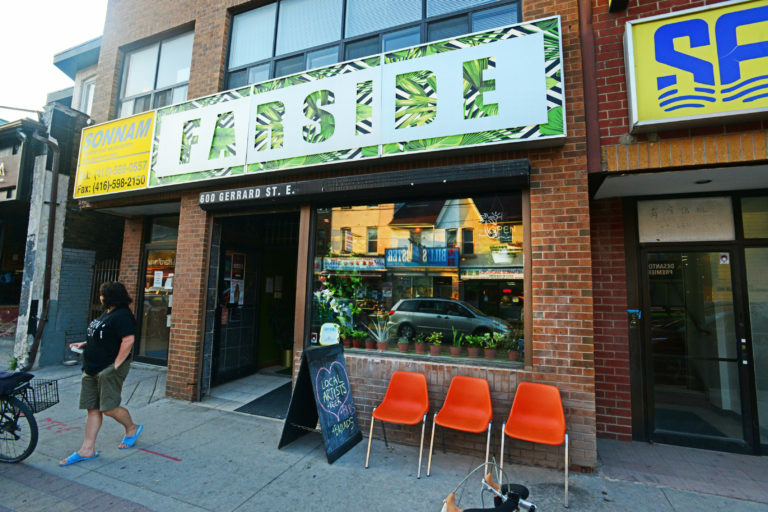 Priding itself on its sense of community, Farside calls itself the neighbourhood’s communal living room. Nestled in the heart of Riverdale at 600 Gerrard St. E., the bar is an anomaly. It’d be difficult to find any other locations in the area that can speak to the vibrancy of the community. The bar also hosts Post a Letter Social Activity Club, where patrons write letters to politicians, loved ones and everyone in between. Time travel never looked so good. Comfy sofas are upholstered with fabric straight out of the 90’s (florally and reminiscent of something you’d find in your granny’s basement) and are stationed right by the front window. The wall behind the couches is adorned with a mural (which photos just don’t do justice), painted by a Toronto artist. Friends curl up, gathering their wits for trivia night. Russel gives you a sheet of paper for your trivia answers and asks for your team name. You are now a member of Farside Trivia Club. Order classics and cocktails at the bar. You’re part of the community as soon as you walk through the door. The bartender hands you a menu, each one showcasing a different illustration by a Toronto artist. While ordering a drink and hot dogs, a Disney VHS plays from a projector onto the back wall of the bar. It feels like you’re 10 years old again, hanging out at friend’s house in 1998… except you can drink alcohol. At the end, Russel returns your trivia sheet and gives you a sticker. You’ve earned it! Stay a while. Have another drink. Maybe celebrate with a piece of cake served on a Spice Girls plate. (This is a real item on the menu!) It’s not everyday you get to time travel to the 90’s. The seating is as comfy as your nana's old sofa and the mural by a local artist adds a sense of Toronto community pride.